The peacock spread his tail and pushed away the fairy crane, hands moving like clouds he strikes the tiger and parts the wild horses mane. Then the fair maiden saw the golden rooster bend his bow and shoot the tiger and carry the tiger back to the mountain. 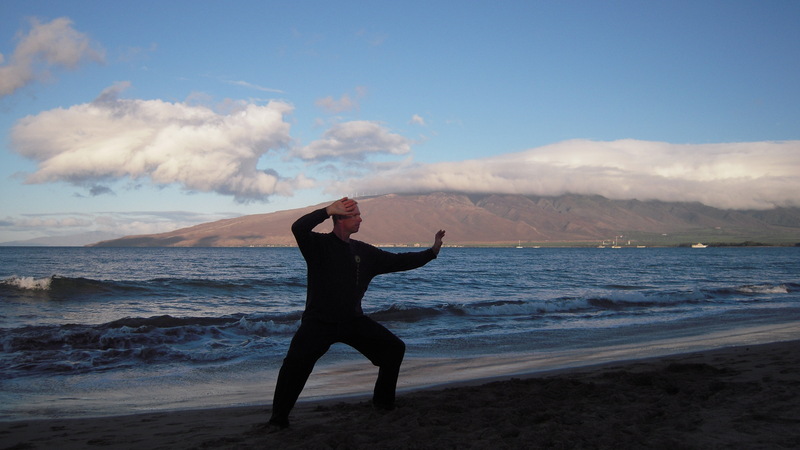 This poem helps to remember the Taiji forms repeated in the Taiji Gong Qigong. These nine movments capture the spirit of Taiji; this can be enjoyed sitting or standing. Warm-up,,,,start with zhan zhaung training, wuji. Then repeat each move left and right three, five or seven times each. 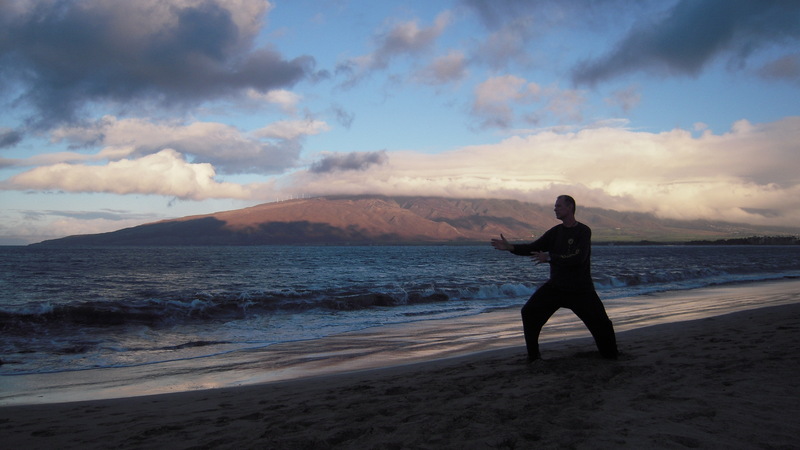 Join Taiji on Maui and learn from Sifu Fong Ha at our exclusive Workshop this month. 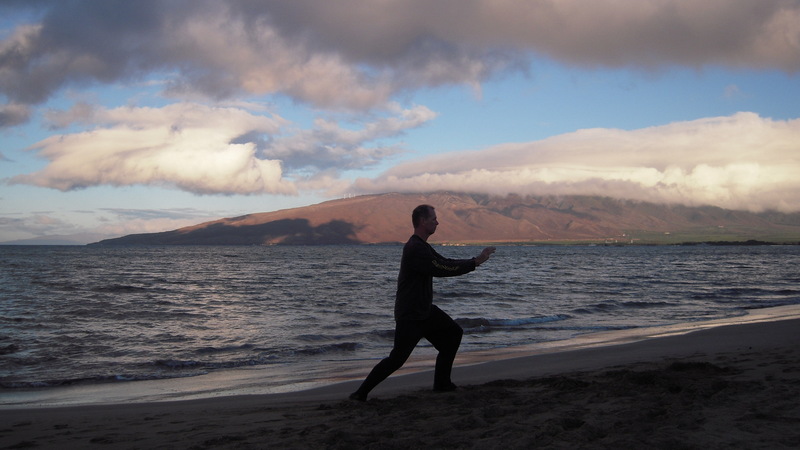 On Sunday September 25th for four hours Master Ha will give detailed instruction in his methods of Qigong and Taiji principles. Starting at 10:00 AM until 12:00 and from 1:00 until 3:00 PM we will be training at a private residence in Maui Meadows. This class is for students of all levels. We are very fortunate to get a semi private workshop limited to about twenty students for the very affordable price of $25.00. 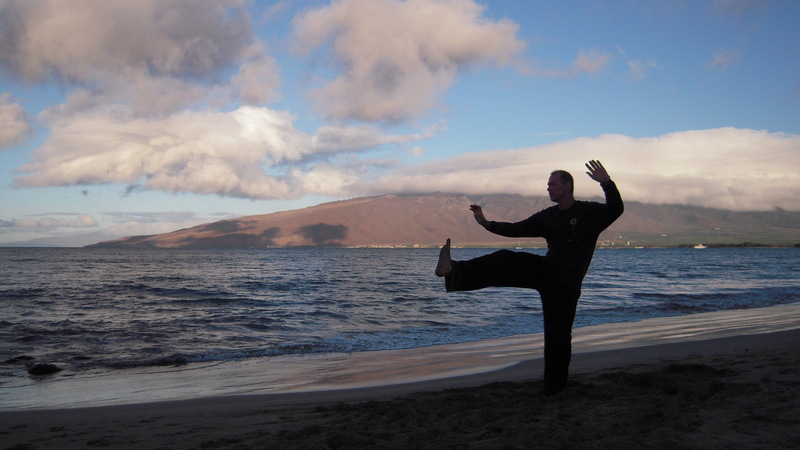 Fong Ha will be on Maui for a whole week starting on Thursday morning the 22nd at Kamaole beach # III at 6:00AM to 9:00 and 5:15 to 6:30PM. He has always let folks come and hang out with him and get in some free practice at the beach. I believe we should give back to him by attending the workshop and getting the full class and paying him for his instruction; all proceeds will go directly to him. 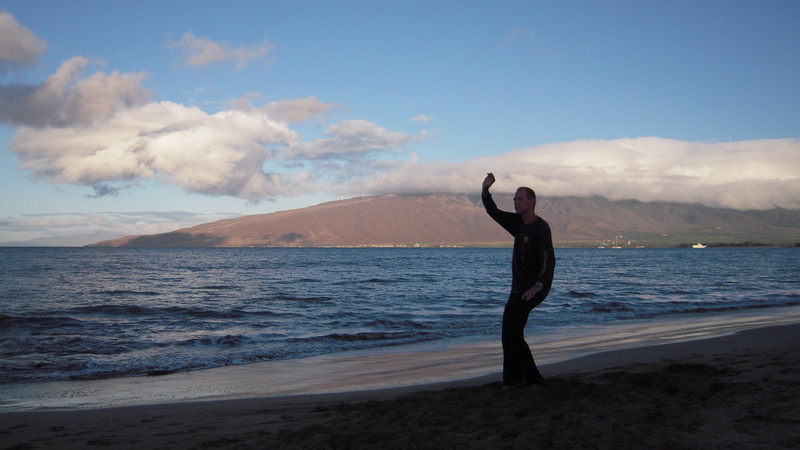 Please join us at the workshop and also at Kamaole beach # 3 for the whole week (except Saturday and Sunday) for practice of what you learn at the workshop. Fong is a very generous and fun man that is a living legend; do not miss this opportunity to train with a genuine Taiji icon. 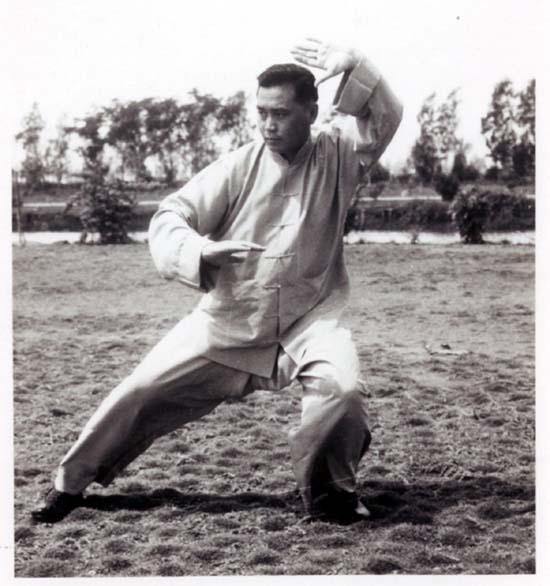 Master Ha started his training in 1953 with Master Dong’s Grand father the great Tung Ying Chieh, he is world renown, and we are blessed to have him for this special workshop. 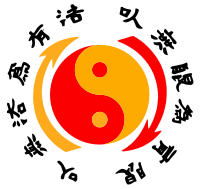 The focus of the last qigong lesson was to introduce the properties of Yin and Yang in the human energy system as it pertains to Qigong practice. 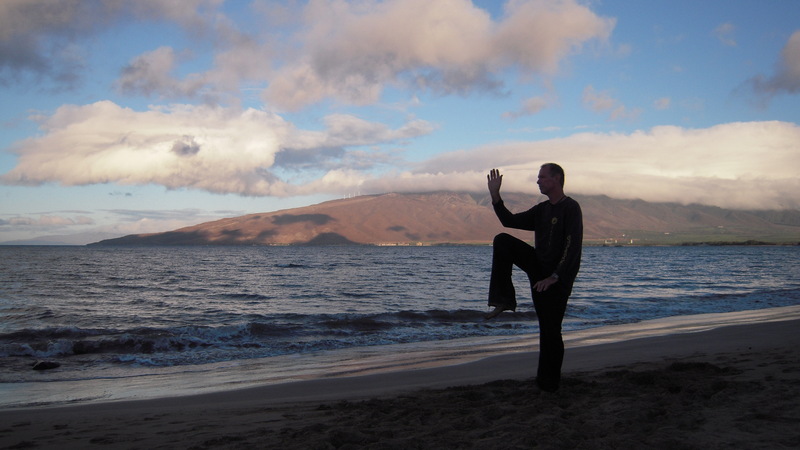 One of the first things qigong students learn is the difference between the way yin and yang manifest during practice. This basic understanding is the starting point to getting to know your energy. Eventually this awareness of yin and yang will be discerned in all of your energy systems. There are many different “energy systems” in the human being and all of them have yin and yang elements. 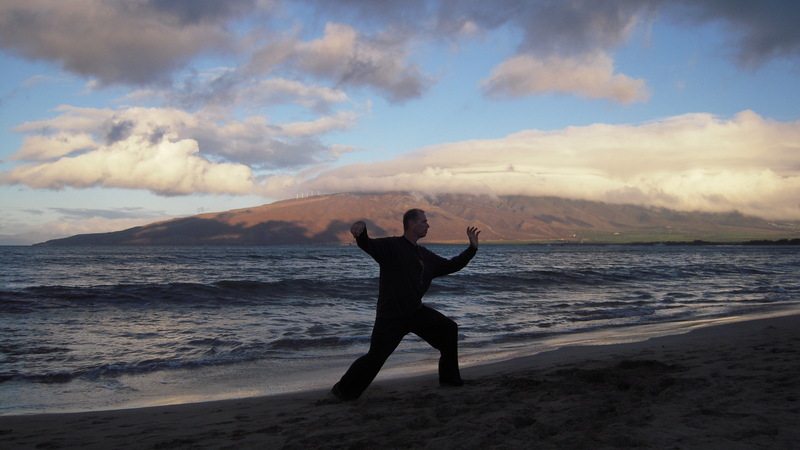 For example in basic qigong practice the most obvious energy system in the physical body are things like muscles and bones; pneumatic (breath) and hydraulic (blood and lymph) but there are others such as mental, emotional, spiritual, electrical (nervous), and chemical, like hormones and neurotransmitters. The reality of life is there are no absolutes; energies are always in ebb and flow. In the last lesson I used a diagram showing the separation of yin and yang, this is only to get a basic understanding of the rise and fall of the energy; this symbol could be called Yin AND Yang. The Taiji symbol is sometimes called the Yin/Yang diagram. Do see the difference between the two? Yin and Yang or Yin/Yang, the difference is the first one defines yin and yang as distinctly different and separate things; the second one shows the harmony between the two. In the title to my web site, I say “Balance and Harmony for a better life.” Balance and harmony is a common phrase; some people reverse the two words however saying “harmony and balance.” To my mind though, you need balance before you can have harmony. This is an important point for you to realize in your training as qigong and Taiji works on us to first balance our energy so that we can harmonize with reality. Again this is true whether we are talking about emotions or our bodies…. For example, if we have balanced emotions then we can harmonize with others. Harmony is what we get when we have all our energy systems working together in a synergistic way. Synergy is a good word, it is when the sum is greater than the parts; you know, sort of like one plus one equals three. Now while some of our energies may be “Yang” there will be others that will be “Yin.” For example, my mind may be yin while my body is yang, while at the same time my legs may be yang while my arms may be yin and my emotions could be yin while my spirit is yang! Yet it all works together in harmony. When the thinking mind is softened and yin, the spirit fills with energy and could be considered yang. When I am moving my body upward there is energy coming up from my legs which could be considered yang at that moment yet I keep my hands soft (with my mind) making them effectively yin. Yang leads and yin nurtures. For example my intention (yang) tells my body to relax (yin) the relaxed body attracts energy to flow into it, yang. Lets say for example, the energy (in the form of blood pressure) is down in the legs, (yang) then, when we relax the hands (yin) the energy will flow into them, and back and forth filling and emptying. 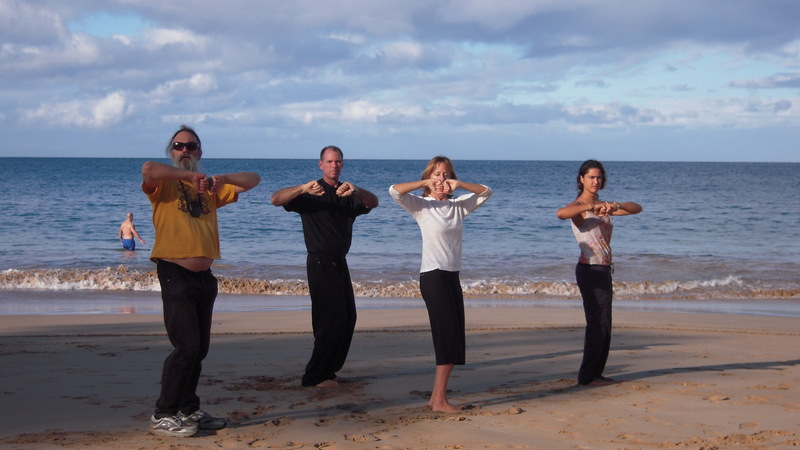 While doing qigong notice how you can control the flow of energy when doing the movements by sequentially relaxing and expanding. As you are alternately flexing and relaxing different groups of muscles, you can lead the qi through your body. Remember, the energy wants to flow into emptiness just as electricity seeks a ground or water (and air) flows from high pressure towards low pressure. In the great source book of Taoism, the Tao Te Ching, Lao Tzu tells us, “The sage leads by following, by putting himself beneath others they all flow towards him.” Can you see how the philosophy of Taoism teaches us how to be better people? The stallion leads the way with the nurturing mare just behind him, giving him encouragement and moral support. She wants him to lead, and he enjoys doing the hard work of blazing the trail and such. The clever mare knows how to get him to lead where she wants to go by using her soft nurturing way, and he is glad to go where she wants him to. The two move in harmony due to the balance of their complementary energies. Standing builds structural integrity in your physique, calms the mind and emotions and it provides a foundation for internal qigong work known as “nei gong”. As you are learning to connect with your internal energy, many new and intriguing adventures will open up to your awareness. In fact, awareness is the primary connection that you make as the path unfolds before you. You can reach your health goals whatever they may be, whether they are physical health, as in posture, flexibility, balance or general strengthening or mental goals such as, improved memory, freedom from excessive thoughts or disordered thinking, or perhaps emotional goals like curing frustration, mania, anger, fear, grief, worry, depression or whatever else. The one common denominator in almost all ailments is unbalanced energy within you. Even the most devastating illnesses often have their roots in basic problems with your personal energy and many are therefore preventable. 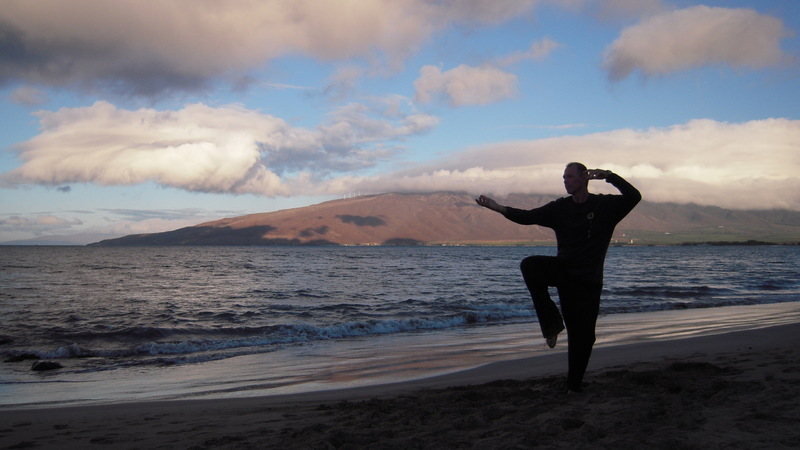 Balancing our energies is the goal of all traditional Chinese medicine and Qigong is a basic part of TCM. 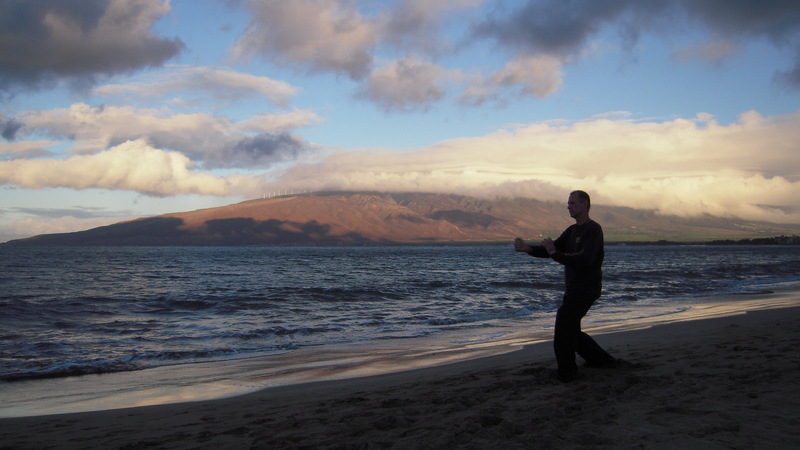 In the first two Qigong “lessons” here on this blog, I outlined the first skill you should master, Wuji. 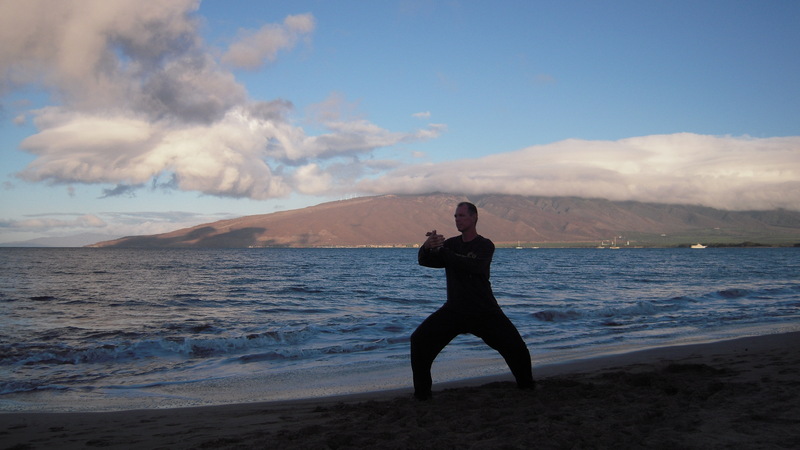 As the name implies Wuji is a starting point and it is where we begin all qigong exercises and the Taiji forms, yet there is a whole genre of “Wuji training” that can be explored. Standing is sometimes called zhan zhuang, which means “standing like a post”, or referred to as standing meditation; it is in fact an excellent qigong exercise all by itself. There are no real ”forms“ per se, instead individual postures are sustained for a length of time as necessary. The main goal here is to balance out our internal energy by standing still, however stilling your body often encourages thinking to arise; sometimes the thinking can become overwhelming. Redirect your thoughts into becoming aware of the 12 points outlined in the last lesson and only allow your thoughts to go through the “postural check list”. Another technique to stop unnecessary thinking, is to simply count your breaths; paying attention to the air moving in and out as you do. When you find yourself caught up in a daydream, just start over with the alignment and then find your way back to your breathing; in this way you will learn to dissolve your mind and body together. After we still our bodies, and refocus our thinking, errant energy tends to go into the emotions. This can be very annoying as thoughts and emotions are linked, often emotional thoughts like: “I feel dumb standing here”, “What are others thinking about me seeing me standing here?”, or “Am I wasting my time standing here?” Any excuse we can dream up to release us from learning about our true selves seems like a good enough reason to stop our training. Just go back through the same routine and you will find these emotions subside. While standing in a posture, there are many other techniques that you may apply, such as various breathing practices and a whole host of higher-level skills known as “nei gong“. 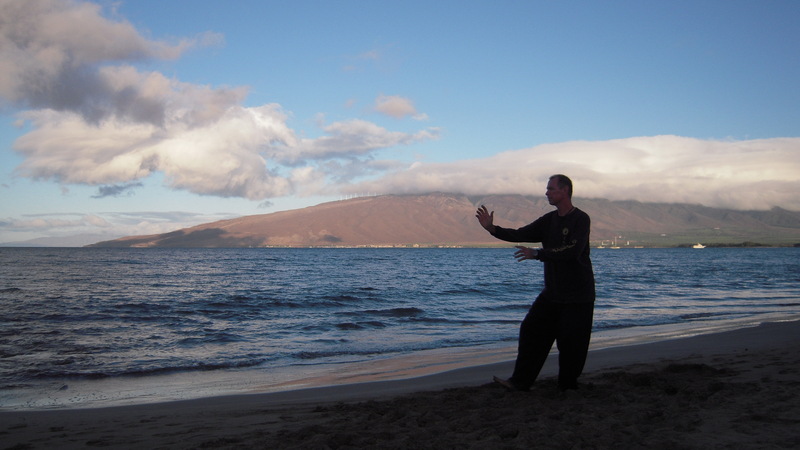 These skills will be explained in future articles about that topic but the first step into that whole universe of qigong arts starts with zhan zhuang. 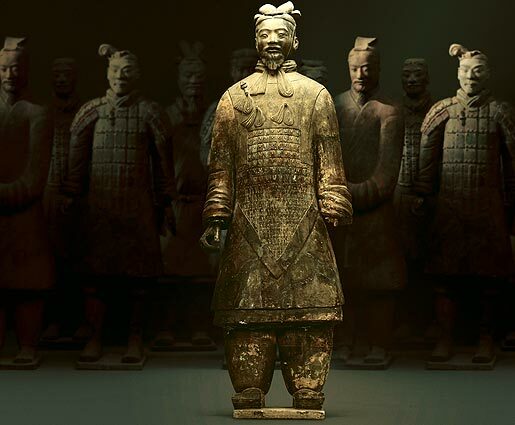 To perform zhan zhuang all you need to do is stand, correctly of course, in any one of numerous postures. To avoid an emotional reason to give up, commit before hand to doing zhan zhuang for a certain length of time, say 10 or 15 minutes. You may stand in Wuji, or pick some postures from the Taiji form. In the beginning I recommend you attempt at least three minutes in each posture, that way you will not get bored so that during the 15 minutes you could manage five postures. Serious zhan zhuang practitioners may stand for up to an hour in one or two postures! In coming lessons, I will show you some postures that can be used in addition to the ones you are learning as part of a Taiji class. Who knew that by just standing you could accomplish so much without knowing any forms? Stand strong and you will develop good balance, strength, and energy.